Can you call it exploring when returning to an old trail feels new? Years before my newly anointed moniker, I would have been known as Mr. UltraValley, a man who loved running long distances with little framework in mind. There were no GPS devices or google maps, I just looked at a Thomas Guide or hiking books and hoped my guesswork would loop me back after three hours. A hip injury ended those long excursions, but not my desire to feel alone with nature. 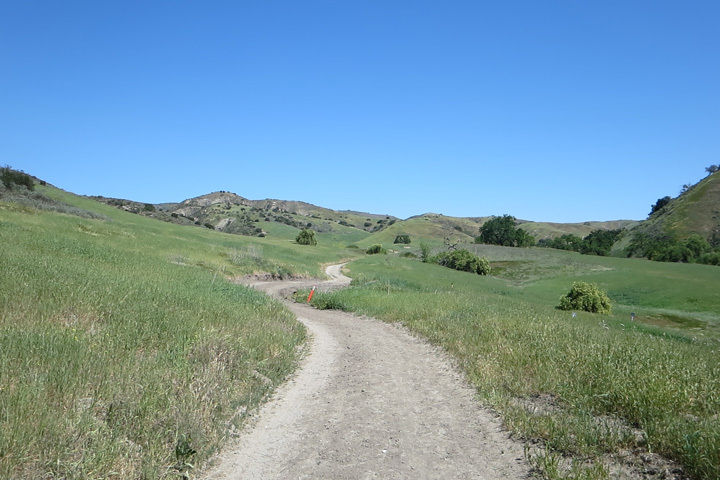 One of my favorite places to run has always been the Upper Las Virgenes Canyon Open Space Preserve and I’ve always yearned for a return engagement, since it’s been over six years since my feet touched that dirt. Truth be told, it’s been so long that I’ve forgotten many of the details, but not that experience from the sense of freedom I felt. A couple of weeks ago, I finally made my triumphant return with my friend, Doug, both of us with our cyclocross bikes in tow. Our plan was to do a 26 mile loop starting from the bottom of Chesebro Canyon, but there was a massive backup on the 101 going through Calabasas. 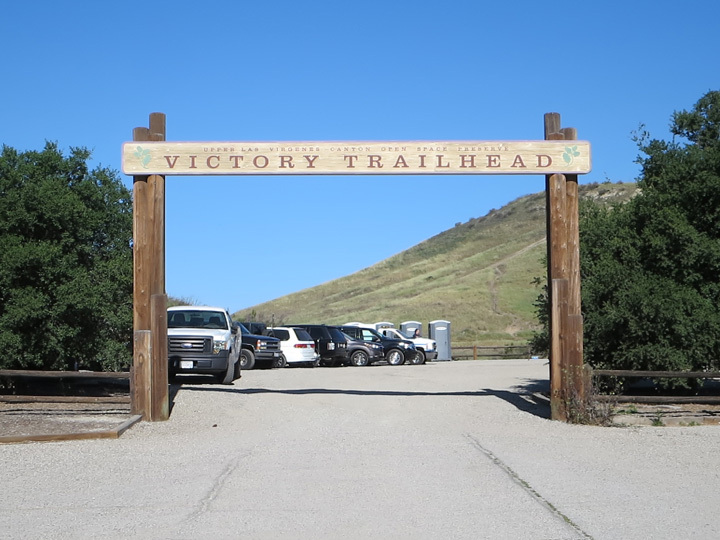 Although it reduced our number of bailout points, we decided to start from the Victory Trailhead instead. Once we rolled through that emblematic archway, we were instantly greeted to one of my favorite forms of landscapes: lush, green rolling hills. Instantly I felt removed from the smog filled suburbs of the valley to one of those isolated portions of the Central Coast. 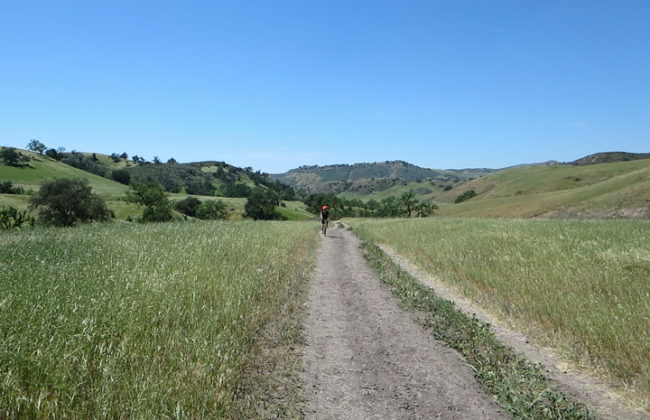 After navigating through a number of joggers taking place in an organized trail run, we made a U-Turn about a mile up a short climb that gave us a better overview of the hills. While I was about to take it all in, at the peak, I didn’t quite handle a protruding rock and patiently toppled over like a turtle. I couldn’t even understand what was going on at the time, but somehow my rear wheel was perpendicular to the ground. 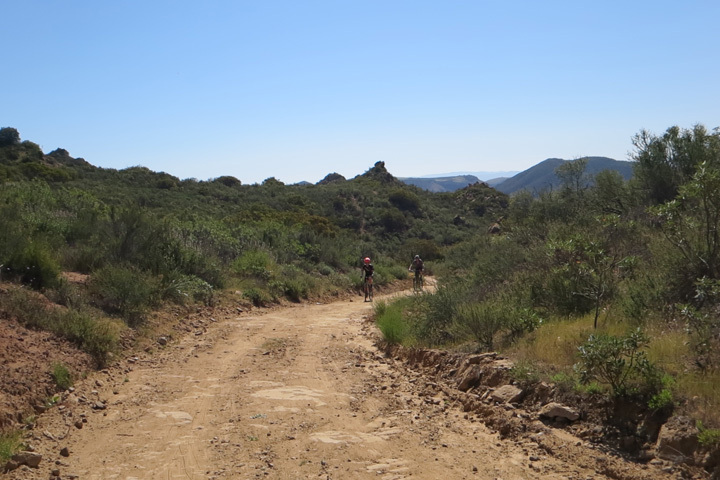 Things leveled out a bit and we descended down Crummer Canyon Road to leave the park for four miles to start at the Chesebro Canyon climb. Once we turned onto that road, I was reminded that people in Agoura own horses. And a lot of them. I think owning bikes are far cheaper. 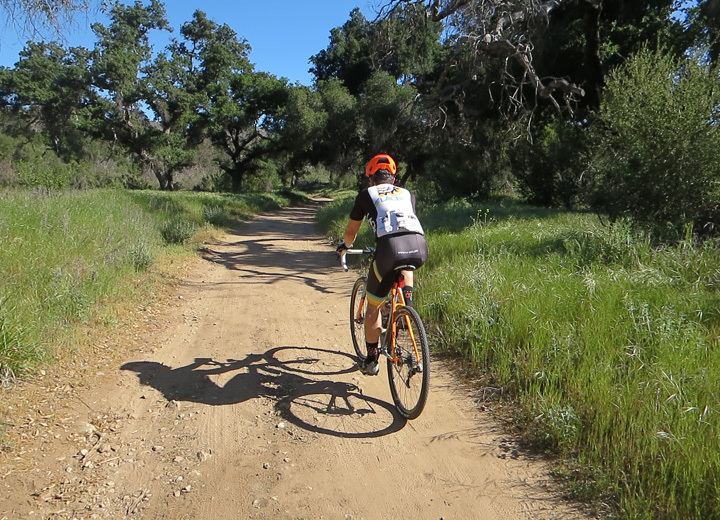 After riding through the multi-acred estates, we returned to the grasslands straddling a dried out creek. The benefit was the number of sycamore trees that offered periods of shade as we moseyed up a gradual incline. After a couple of miles, you’re suddenly transformed into a craggy moonscape which alters the hue of everything you see. This also coincides with a very difficult 1.5 mile Palo climb averaging 9% that offers no hints of its apex. No doubt about it, you’re going to feel sweaty and dirty doing this climb no matter what speed you take it at. Fortunately when we hit the top, we had a moment to recover under some perfectly positioned trees that other riders took advantage of as well. After catching our breath, I inadvertently led us on a single track short cut that was a blessing in disguise. 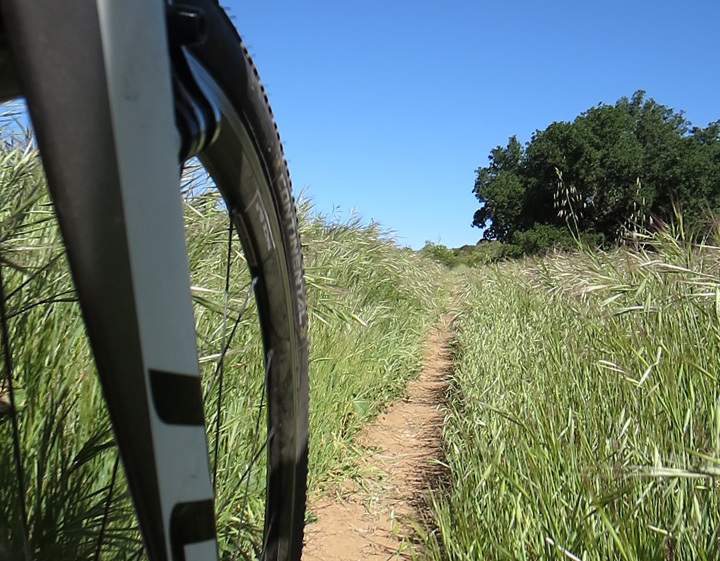 It was a beautifully abstract experience to bike through an eight inch strip of dirt through a knee high field of verdant grass. And, somehow all those pokey things didn’t get caught in my socks! 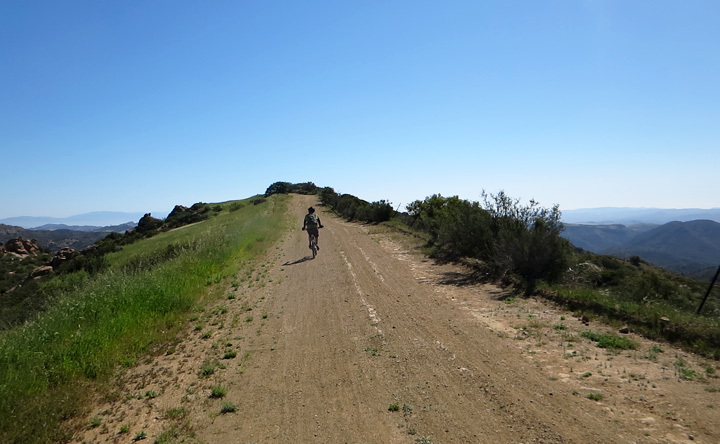 As soon as we poked out to the fire road, there were a number of mountain bikers on hand that confirmed that we were headed in the right general direction. Heading eastward on the Albertson Fire Road, views started opening up around the area, especially after we did a half mile climb averaging 11% to the peak. 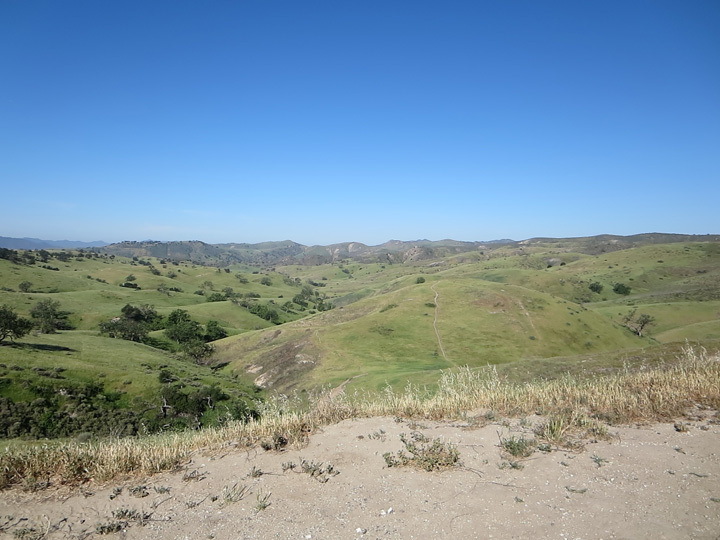 There, we had a real clear 360 view including the expanse we call Simi Valley. We also got a glance where our next descent would lead us: up the Powerline climb. It is only .6 miles at a 10% clip, but it’s a bit rocky and you worry a bit if you’re taking one of side roads to one of the towers. At this point, I couldn’t believe I used to RUN all the way out here and that I still had a partial memory of where to go. The overview really helped and we fortunately mazed through correctly. 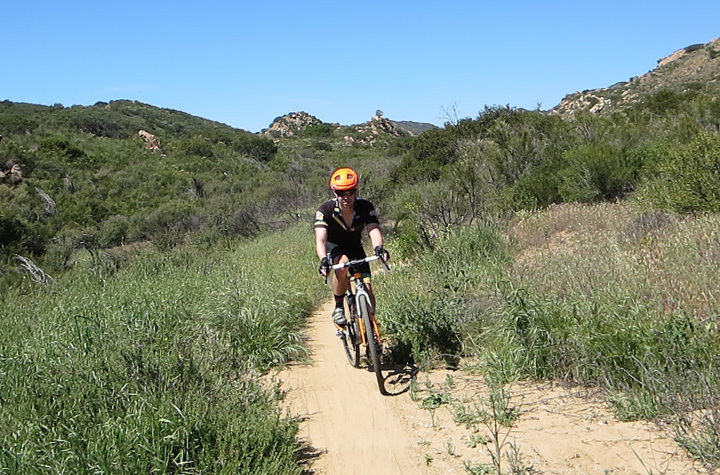 With my biceps tiring from all the brake grippage, we turned left onto the Las Virgenes Canyon Trail which led us down an extremely rocky stretch of single track. Needless to say, I was pretty unprepared for this. I should have known on the more manageable section when we were crossed paths with mountain bikers climbing up as they were cheering us on for trying such a feat. Yeah, they didn’t see the second spill of the day I took, although you can’t really categorize it as such since I leaped off my bike fleeing the scene as it bounced off the rocks. After a little hiking, conditions returned to fluid as we met up with the Bell Canyon Fire Road. This was very similar to the Chesebro Canyon start and a nice reward for just finishing the game of human pinball. Our trip reached its final stage as we turned onto East Las Virgenes Canyon road which brought us back to the ideal setting we started with. Even though our day was ending, seeing all those smooth, green hillsides made you want to explore more. Now that I think about it, we were fortunate that the freeway backup caused us to start here. Finishing with these hills is far better than rolling through the suburbs. This was a fantastic ride that gave me a lot more confident that I could take my cross bike more places than I could imagine. 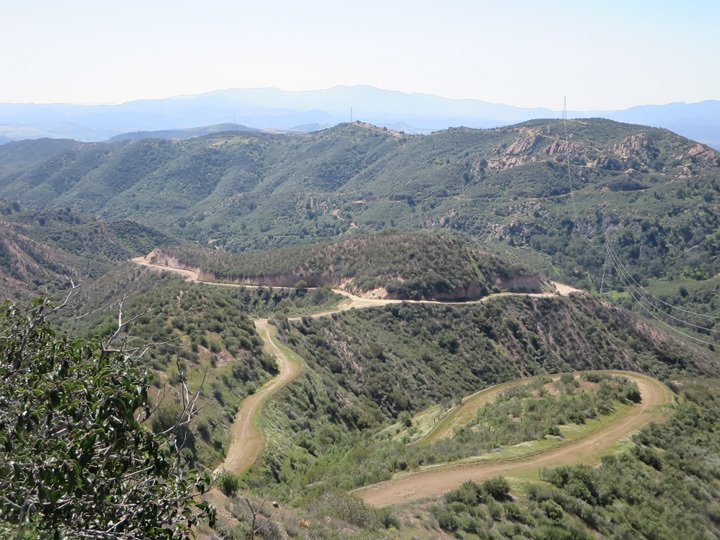 And yes, I imagine I’ll be back at Upper Las Virgenes Canyon soon.